Alongside the new iPad Air 2 and iPad mini 3 Apple introduced the Apple SIM - a way to use just one SIM card and switch between carriers and their services. However AT&T doesn't want to play along and will lock the SIM to only its services. 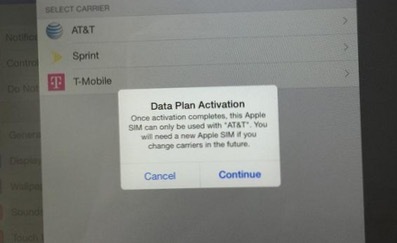 Users have been seeing this disclaimer: "Once activation is complete this Apple SIM can only be used with AT&T. You will need a new Apple SIM if you change carriers in the future". Well that's not nice! This leaves the Apple SIM compatible with Sprint, EE in the UK and T-Mobile in the US, which seems the only working right now in the US - Sprint may have some issues currently. Interestingly if you buy a new cellular Apple iPad Air 2 or mini 3 from Apple or an authorized reseller you'll get an Apple SIM preinstalled but if you buy it from Sprint, for example, it will have a Sprint SIM. It seems carriers aren't really on board with Apple's one for all plan just yet. Blocking sim for a specific carriers it has nothing to do with Apple. Because the simcard was made that can be activated in any carrier without changing any simcards. Make sense... Think first before making nonesense comments.. If your going with AT&T and own a Crapple product at the same time, then your brave or very dumb.